I’m going to show you how to temporarily reroute SharePoint’s outgoing email to your desktop where you can either ignore it or forward it as necessary. There are a variety of legitimate reasons to do this. Generally I’ve used this when working in a small development or testing environment where email isn’t setup and it would be a huge hassle. However, I’ve also done this to test changes that involve email blasts (like false alarms on mysite deletions or screwy workflow debugging). As with anything, use some common sense about how and when to use this. To run a dummy SMTP server on your desktop you’ll want to use smtp4dev by RNWood. This is a great little program that sits in the system tray and intercepts messages sent to it. You can then view, save or even forward them (from your account) and more. I’ve used it for years for all sorts of projects and I highly recommend it. 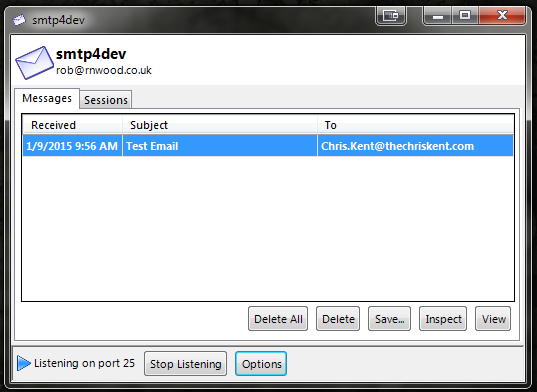 Once you hit okay you will start receiving emails in smtp4dev (So be sure it’s running). You can also make these changes using Stsadm and can apply them to individual web applications instead of the whole farm like shown above. See this article for more details: Configure outgoing e-mail. So how do you know it’s working? Unless this is a large production farm with lots of alerts and other things flying off all the time you may not see anything at all. You can of course setup alerts on some list and then trigger events that would send the alert, but that can be a big hassle. Fortunately, you can have SharePoint send you an email through PowerShell. $body = "This is a test email sent from SharePoint, Wowee!!" That’s it! Just be sure to switch the settings back if this was a temporary test. Of course, as long as you use your real email address in the to entry above then you can run the TestEmail.ps1 script again to ensure things are sending properly after you switch things back. In SharePoint just checking the box for making a column required or not isn’t always sufficient. Sometimes you want to be able to say something is only required based on the status of another column. This can be done through a list’s validation settings. This recently came up for me when the requirement was that for a contact at least an email address OR a phone number would be required. A contact didn’t need to have both (although they could), but having neither wasn’t an acceptable option. Got multiple requirement groups? Wrap multiple COUNTA calls in an AND statement. One of the nice things is that you can do field level validation in addition to the list level validation shown above. The field level validation (Column Validation) fires before the list level which creates for a smooth user experience. In my previous posts (Phone Validation, Email Address Validation) I showed how to setup column validation for both phone numbers and email addresses and those can be used here. However, the formulas I demonstrated automatically make those required fields since they don’t allow blank fields to pass validation. 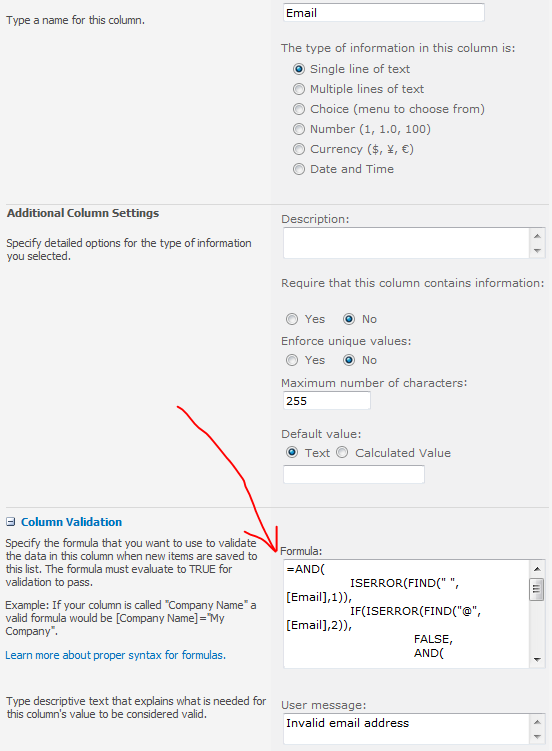 The column validation feature of SharePoint 2010 is pretty awesome but it can be relatively basic when compared to something like regular expressions. 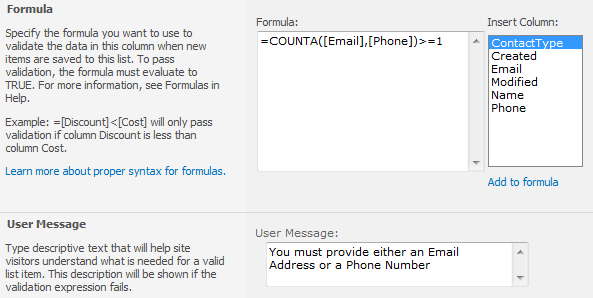 Yesterday I posted about validating phone number columns in SharePoint. Another common request is email addresses. Proper validation of email addresses can be extremely complicated (just check out the Syntax section of the Wikipedia article). I’m sure you can get extra crazy with it and get it even closer to the actual specification, but for my needs some basic validation is all I’m really looking for. Must have at least 1 character between the @ and the . To get this working in SharePoint, just copy the above and do a find and replace on [Email] with whatever your column is named. SharePoint will remove all the extra line breaks as soon as you save it. Column Validation works by returning true or false. Starting our formula with an AND statement allows us to pass multiple conditions (also returning true or false) and will return true only if all the conditions return true. This allows us to do multiple checks and ensure they all validate correctly. The first check in Line 2 uses the FIND function to check for spaces. The ISERROR function wrapper returns true for any errors found. Since the FIND function returns an error if the string is not found, we’ll get a true for this check only when there are no spaces. This takes care of rule #1. The second check in line 3 searches for an @ symbol using the FIND function beginning with the 2nd character. This ensures the @ symbol is not the first character (rule #3). Having found the @, we put a second AND statement in line 5 to check some things concerning the @ we just found. The check in line 6 uses a FIND to look for another @ symbol starting with the character after (+1) where we found the first one. This takes care of rule #2. Next we check for a period after the @ symbol in line 7. We do something similar to the above check except that we start with the 2nd character after (+2) where we found the @ symbol. This ensures there is at least 1 character between the @ and the period (rule #5) while making sure there is at least 1 period (rule #4). Now that we’ve established there is a period after the @ we make sure that the location of that period is less than the length of the whole string using the LEN function. This makes sure the last character is not the period (rule #6). There are several holes here which could be corrected by complicating the formula quite a bit (I’d be happy to have suggestions in the comments), but for 98% of all entries this is going to be sufficient. If this is for a public facing form you’ll probably want to invest more time in increasing the complexity of this formula, but for your normal internal sites this should be more than good enough. More information and a full example can be found on my Requirement Groups entry.